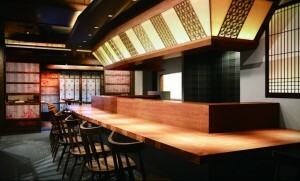 DASHIHIDE, a new ‘High-Color Washoku’ restaurant with secret dash recipes inherited from Azabu Shu. On November 28, DASHIHIDE, a new restaurant with a concept centred around commitment on high-quality dashi, will open in Nishi-Azabu. Inheriting our secret yet high-quality dashi from our sister restaurant, Azabu Shu, we will be introducing Ishigaki beef and Agu pork to Tokyo, both high-quality meats from Okinawa prefecture, along with carefully selected ingredients assembled and presented by committed craftsmen. The interior decoration is also carefully constructed on this theme of ‘High-Color’, with the Japanese concept of ‘Wa’ (harmony) finished in a delicate yet casual atmosphere with some light touches of western influence. The ‘High-Color Washoku’ concept in terms of food, is inherently present in its presentation and service of food. Our menu is created with the intent of having the diner want to take pictures. Among the variety of dishes served in DASHIHIDE, our highest recommendation goes to the ‘Dashi Shabu’. With this crown jewel, you can enjoy the original taste crafted through carefully selected ingredients, our gift to you. Grand Opening Day: 28th November, 2017.